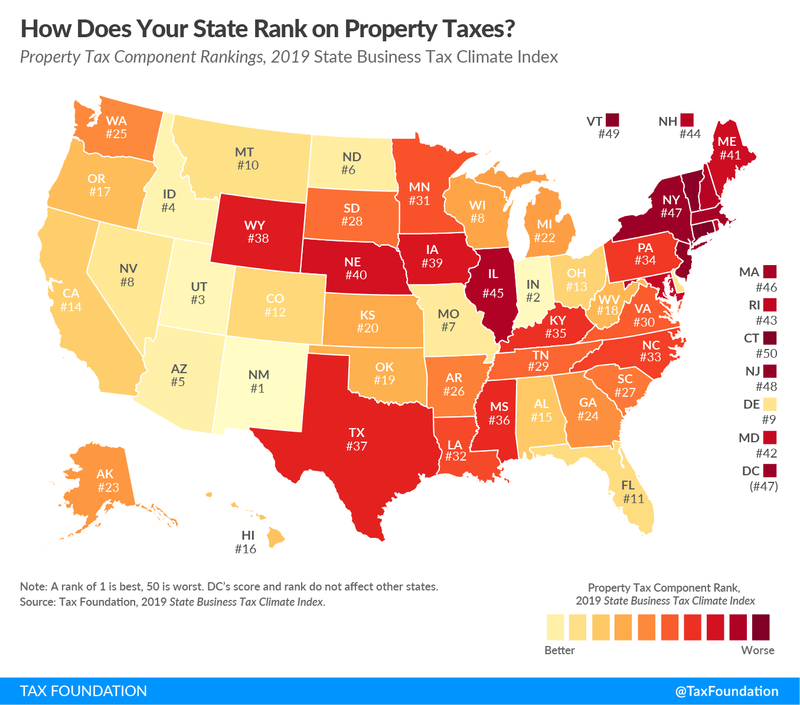 Today’s map shows states’ rankings on the property tax component of the 2019 State Business Tax Climate Index. The Index’s property tax component evaluates state and local taxes on real and personal property, net worth, and asset transfers. The property tax component accounts for 15.4 percent of each state’s overall Index score. Property taxes matter to businesses for several reasons. To start, tax rates on commercial property are often higher than the rates on comparable residential property. In addition, many states and localities levy taxes not only on the land and buildings a business owns, but also on tangible property, such as machinery, equipment, and office furniture, as well as intangible property, such as trademarks. Across the nation, property taxes represent one of the most substantial state and local tax burdens most businesses face. In fiscal year 2013, taxes on real, personal, and utility property accounted for 36.1 percent of all taxes paid by businesses to state and local governments. While taxes on real property tend to be publicly unpopular, when structured properly, they conform well to the benefit principle (the idea in public finance that taxes paid should relate to benefits received), and they are more transparent than other taxes. However, taxes on intangible property, wealth, and asset transfers are harmful and distortive. States that levy such taxes–including capital stock taxes, inventory and intangible property taxes, and estate, inheritance, gift, and real estate transfer taxes–are less attractive for business investment because these taxes at times incentivize business decisions that are contrary to basic economic principles. For example, businesses with valuable trademarks may seek to avoid states with intangible property taxes, and retailers that store large amounts of merchandise might alter their business practices in states with high inventory taxes. States put themselves in a better position to attract business investment when they maintain competitive real property tax rates and avoid harmful taxes on intangible property, wealth, and asset transfers. This year, the states with the best scores on the property tax component are New Mexico, Indiana, Utah, Idaho, Arizona, and North Dakota. On the other end of the spectrum, Connecticut, Vermont, New Jersey, New York, the District of Columbia, Massachusetts, and Illinois had the lowest scores on the property tax component. To see an interactive version of states’ rankings on the Index’s property tax component, click the map above. To gauge whether your state’s property tax structure has become more or less competitive in the past four years, see the table above.